Electric's:12 v running lights, Furuno GPS,Depth sounder, 12/110 v fridge/freezer,stereo, VHF 400 watt inverter,2 solar panels, 130 watts, Raymarine 2000 tiller pilot, 2 plate propane cooker,pressure water both hulls. Accommodations are in both hulls, 3/4 berths going aft from main hatch and double fold down in the centre of each hull.Head in each hull all the way forward. Forward of the centre cross beam is trampoline. I have made a solid core floor from the centre beam to the aft beam. 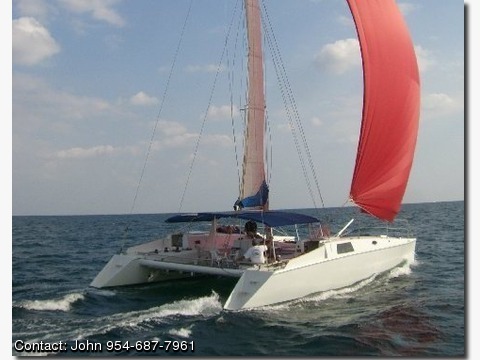 There is a large permanent aluminum frame bimini covering centre section.